Down, down, down… Through the war-wounds of Fascist Spain, through ovarian entrances, through womb corridors, through Freudian angst, Gothic art, insect-fear, body horror, religious iconography, wicked slashes of Bunuelian humour… through the looking glass into Guillermo del Toro‘s psyche itself. 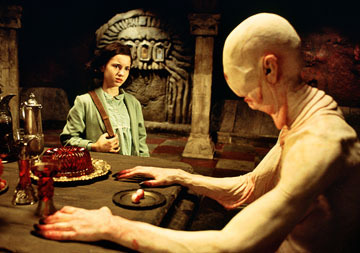 His most personal film, the one he’s wanted to make from the beginning, Pan’s Labyrinth brings the inside out with unforgettable force. With 10-year-old Ofelia (Ivana Baquero) as our guide, it’s a journey into the obsessions that have been burrowing through del Toro’s work ever he since first picked up a Super-8 camera, opened a bottle of ketchup and started talking to the monsters. From tiny forest sprites to goat-horn guardian Pan (Doug Jones), del Toro’s fairytale lets loose some of the most memorable creatures ever to have crawled off his brainpan. But for the Mexican pulp-horror auteur – who knows the feeling of a gun against his head, who saw his first dead body aged four – this is a double-reality of the divine and demonic, where the monsters of the labyrinth are only the shadows of those in the real world. Even the most terrifying creation of his career – the white-skinned ‘Pale Man’ whose eternal last supper is one of modern horror’s most heart-pulping scenes – is no more horrific than Sergi Lopez’s sadistic Nazi father-figure.